THIS gnome is a long way from home! Perched on a gatepost near the Gooseneck, he was one of several spotted by motorists driving on the Mountain Road in recent weeks. Ramsey Police said they had no idea where the gnomes had wandered off from. Whilst Bernard has not been very well of late this has raised a smile. Could it be Happy or have the Constabulary failed to make an identification. 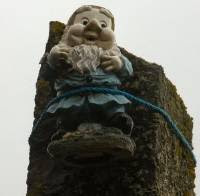 Maybe specialist help is being flown in from the Gnome Office even. If no progress is made on the case things could begin to look Grimm. ‹ Manx Radio officially has the highest weekly audience reach of any station in the British Isles.